Everyday Cream Shadow for Lifted Lids! 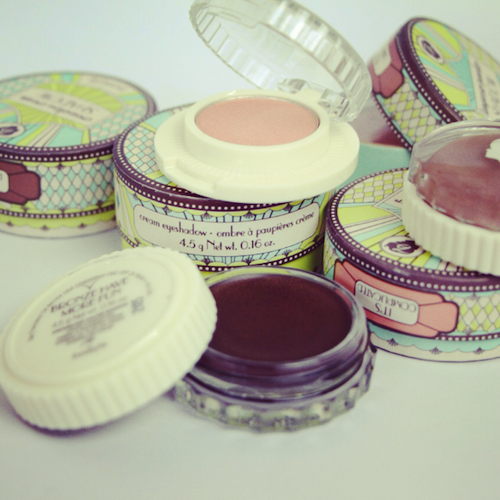 I really like the new(ish) cream shadows from Benefit. Smooth, non-creasing and great either worn alone or as a shadow base. My favourite shades are Bronze Have More Fun and No Pressure – both leave a gorgeous sheen on the lids, though Bronze is far richer in tone. You can see what No Pressure looks like in the photo below – excuse the sombre expression, it’s a still from a video! It’s such a nice wash of gleaming neutral colour, don’t you think? It’s just like a bit of a pick-me-up for the lids – not shimmery or sparkly, just very, very sheeny and light. For those who just like to whack on a bit of something for daytime, it’s perfect. I’m also more than a little enamoured by the packaging, though it’s not entirely practical; flat glass jars with fluted edges, like flan or pie dishes for a Barbie doll. Very cute. The outer cardboard packaging is also nice and pretty – this is proper dressing table fodder. Each creaseless cream shadow costs £15.50 – not the cheapest version on the market, but then distinctly good value in comparison to a certain cream shadow mentioned last week! Not a huge outlay, at any rate, for a product that can and probably will be used daily. You can add some darker shadow to the outer lids for evening, too, so it’s a real all-dayer. Stay tuned for a more intense cream shadow look in the next couple of weeks. Benefit Creaseless Cream Shadows, £15.50 with free delivery from FeelUnique and counters nationwide.